If we're friends, I've probably tried to push this deodorant on you at some point. Emily mentions it in her Nosy Interview (as well as in her great gift guide, while wondering whether deodorant makes a weird gift. I have given deodorant paired with a copy of No More Dirty Looks as a gift--nice but probably also paranoia-inducing. Sorry & you're welcome!). This deodorant is long overdue for a post of its own not so much for its smell (which is pleasant, if a bit lavender-heavy for my tastes), but for its incredible ability to be an all-natural deodorant that actually works! 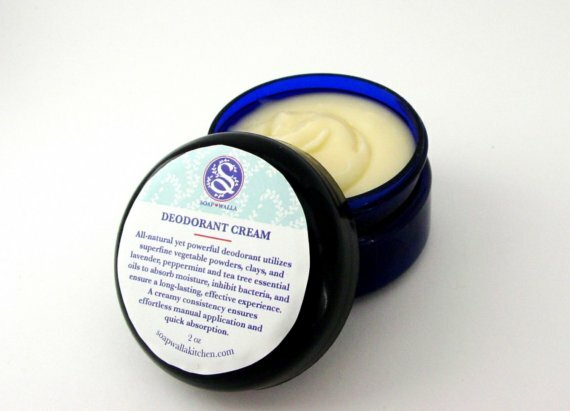 As anyone who has been on a quest for a suitable natural deodorant will tell you, most of them do not work, or work for just a few weeks, or "work" by morphing your own stinkies into some new, maybe even more powerful, stank. Some people are turned off by the application; as you can see, it comes in a pot rather than a stick, so you use your fingers to put it on. But, as Soapwalla creator Rachel Winard herself assures us in a recent, delightful Hairpin interview, "there's nothing weird about touching one's armpits." Maybe you'll even come to enjoy it, along with legions of finger-scooping Soapwalla deodorant cream lovers, all of us smelling really great. I know we've talked about this before, but I still don't get why people are put off by the idea of touching their own armpits!!! Is this an American thing to which I managed to remain oblivious for the fourteen years I lived there?!? Honestly, why should touching *any* part of your own body gross you out (let alone something so innocuous as armpits, which I would very much like to assume people touch every day in the shower)?!? Maybe there are one or two parts you might want to wash your hands after touching, but you should still be able to touch them, shouldn't you? Maybe it's the years of training? People get so used to applying deodorant in this way that the alternative is off-putting at first? Or the fact that a bit of the product remains on the fingers after use (though the same could obviously be said of many creams and lotions applied by hand)? (And don't people use their fingers to get the last of the deodorant from the stick anyway? No? Only cheapskates like me?) This deodorant is gaining quite a following, though, so perhaps future generations will grow up unburdened by the belief that a plastic stick should serve as buffer to any armpit-touching.